Sweet potatoes can be consumed in a variety of ways, commonly boiled, baked, steamed, or fried. They are most commonly orange, but can be other colors including: white, red, pink, violet, yellow, purple. Sweet potatoes should not be confused with yams, another starchy root vegetable, which are actually two completely different plants. These two types of sweet potatoes cook differently. Firm sweet potatoes remain firm and slightly waxy after cooking, while soft sweet potatoes become creamy, fluffy, and moist. Sweet potatoes and yams are to completely different vegetables. They are both tuberous root vegetables, but are not related and do not actually have a lot in common. Compared to sweet potatoes, yams are starchier and drier. Believe it or not, true yams are not very common in the United States. True yams can be tough to find. They aren’t carried in many local grocery stores. Best chances of finding them are international and/or specialty markets. The yams in the grocery store are more than likely sweet potatoes. As mentioned above, there are two major types of sweet potatoes in the U.S., firm and soft. The firm sweet potatoes were the first to be produced in the U.S (the yellow sweet potato). When soft sweet potatoes (orange sweet potatoes) began to be produced, there was a need to call them something different than the firm potato. Since soft (orange) sweet potatoes slightly resemble true yams, they decided to call them yams becoming the “yams” you see in the grocery store. So unless you are searching for yams at specialty or international markets, chances are you’ve never had a true yam!! The orange-flesh sweet potatoes (sometimes labeled yams) are very good sources of Vitamin A (in the form of beta-carotene), vitamin C, manganese, copper, pantothenic acid, and vitamin B5. Additionally, they are decent sources of potassium, dietary fiber, niacin, thiamin, and riboflavin. 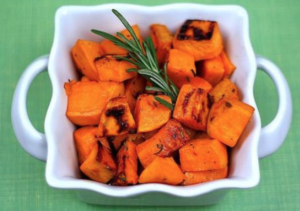 Finally, sweet potatoes contain a number of plant compounds called antioxidants. The antioxidant activity in the potato increases with the color intensity of the flesh. It is highly in colored varieties such as deep orange, purple, and red sweet potatoes. Overall, sweet potatoes are excellent sources of vitamin A, as well as many other vitamins, minerals, and antioxidant. They are also a rich source of complex carbohydrates and fiber. Sweet potatoes contain smaller amounts of protein and very minimal amount of fat. They are very tasty and can be made numerous different ways. To get you started, I’ve included five different recipes that I love! 2. In a small bowl, combine cumin, salt, and pepper. Set aside. 3. Peel the potatoes, cut each in half lengthwise, and cut each half into 6 wedges. 4. In a large bowl, combine the sweet potatoes, oil, and spice mixture. 5. Toss until potatoes are evenly coated. 1. On a baking sheet, arrange potatoes in a single layer and place in the oven. 1. Preheat oven to 250 degrees F and position oven rack in the center of the oven. 3. Toss slices in olive oil to lightly coat and then sprinkle with salt. 4. Lay out potatoes in a single layer on a baking sheet or pan. 2. Line a large, rimmed baking sheet with parchment paper. Brush the parchment paper with olive oil. 4. Spread the cubed sweet potatoes out over the baking sheet and season them with a little bit of salt and pepper. 7. Cool leftovers before storing in an airtight container in the fridge for up to 5 days. Add roasted sweet potatoes to the skillet and cooking, stirring often, just until the sweet potatoes are heated through (~1 minute). Once everything is hot, move sweet potato mixture onto a plate, covering them with foil to set aside while cooking the eggs. Wipe out the nonstick skillet with a paper towel, then heat it over medium-low heat. Crack the two eggs into the skillet, sprinkle a pinch of salt and freshly ground pepper, and cook until the egg whites are set but the yolks are still runny (~2-3 minutes). 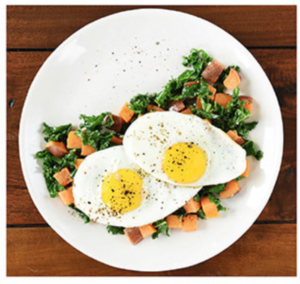 To serve, slide the eggs over the cooked kale and sweet potato mixture. Eat immediately. 2. Line a large baking sheet with parchment paper or a silicone baking mat. 3. 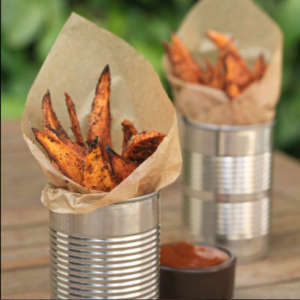 Pierce each sweet potato a few times and bake for 40-50 minutes or until soft. 4. Allow the potatoes to cool slightly. Slice potatoes in half lengthwise. 5. Reduce oven temperature to 375F degrees. 6. 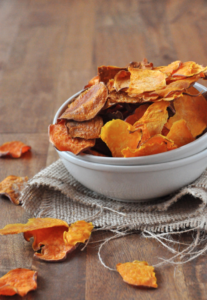 Scoop out sweet potato flesh, leaving a thin layer of sweet potato inside, and add flesh to a medium bowl. 7. Place skins back on the baking sheet face up, drizzle with olive oil and bake for 10 minutes. 8. Mash the sweet potato flesh with milk, salt, and pepper until smooth and creamy. 9 After 10 minutes, remove the skins from the oven. 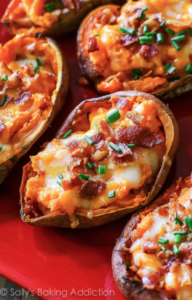 Fill each with an equal amount of mashed sweet potato and top each with cheese. Bake for 15 minutes until the cheese is melted. 10. Remove from the oven and top with bacon. Serve with sour cream and chopped chives, if desired. Skins are best enjoyed immediately. 11. Cover leftovers tightly and store in the refrigerator for up to 3 days.